Besides restaurants devoted to national cuisine Salzburg will offer travelers widest choice of cafes, bars and pizzerias, which will surely become a great place of rest for a large company. Thus, Carpe Diem restaurant offers simply widest selection of international cuisine. In the menu of the restaurant you can find such dishes as spaghetti with various sauces, fish dishes, and hamburgers. If your aim is to try best dishes of Austrian cuisine, you should definitely visit Raschhofer's Rossbräu restaurant as it fits your aim the best. The tables of the restaurant are set on a spacious terrace, which is heated during the cold season, so visitors always have an opportunity to dine on the fresh air. Juicy steaks, flavorful soups in casseroles, homemade sausages and excellent wine – simply no visitor can resist such variety of delicious dishes. Fans of Italian cuisine are recommended to visit the restaurant named Pizzeria Azzurro. The restaurant’s menu is updated regularly. Here are often organized fish weeks, holidays of Mediterranean cuisine and other theme parties. Stadtwirtshaus Gabler restaurant is a prestigious establishment that offers either amazing national dishes or popular dishes from European cuisine. Beer is considered the signature beverage of this restaurant – you will find more than twenty varieties of this drink here. Kaltenhausen brewery remains the main supplier of beer for many years. The factory, which was opened more than five centuries ago, remains one of the most famous manufacturers of beer in the country. Salzburg restaurants specializing in the regional cuisine offer mouthwatering puree soups that have become an essential part of the national gastronomic traditions. These soups can contain various vegetables. Local people like soups with pumpkin, potato, and broccoli. Onion and garlic are among the basic ingredients of all soups of this kind. Some cream soups are served in a bread loaf, and that makes them even more unusual. Fritattensuppe is quite an unusual variant of the first-course dish. This soup comes with freshly baked pancakes. The pancakes are sliced into thin strips and added to the transparent broth. Fritattensuppe is always served with fresh greens. Fans of meat dishes will be pleasantly surprised in Salzburg restaurants as many of them offer interesting dishes with the game. Travelers will be able to order such delicacies as venison stew or interesting dishes with roe deer meat. When describing local meat delicacies, it would be a mistake not to mention wild duck meat. This meat has peculiar taste and aroma. Red cabbage is a typical garnish to meat dishes in many restaurants in Salzburg. Knodel is one more popular garnish in the region. Small Knodel balls made of bread can be served together with meat to replace the traditional bread. Knodel often contains such ingredients as mushrooms, various spices or pieces of crispy fried bacon with spices. Such stuffed Knodel can be served as a separate dish. Family holidays with kids in Salzburg. How to entertain your child, things to show to children. Local lakes are rich in different species of fish. Salzburg chefs have become true professionals in cooking all kinds of fish dishes. Alpine lakes are home to Saibling, a special fish that travelers can try only in this region. Roasting on an open fire is considered the best way to cook fish. This helps to maintain the original taste and flavor of fish. Local chefs use only a tiny bit of spices in that case. Schweinsbraten is one of the main national meals according to local people. The popular roasted pork appeared in Bavaria several centuries ago. It is still regularly cooked and very widespread in the region. However, it is cooked in a slightly different way in Salzburg, so local people consider Schweinsbraten their national meal. Beer remains one of the most popular drinks. The region is famous for such varieties of the foamy drink as Stiegl and Augustiener. Local breweries have already become popular tourist destinations. As a rule, there are national cuisine restaurants close to such breweries. If you happen to order a beer at such a restaurant, the drink will be most likely served together with one of the most popular snacks in the region, Pretzel, which is a twisted knot made of dough and sprinkled with salt. This guide to cuisine and restauraunt in Salzburg is protected by the copyright law. You can re-publish this content with mandatory attribution: direct and active hyperlink to www.orangesmile.com. Travel notes on best cuisine and restaurants of Salzburg (Austria) on OrangeSmile.com. 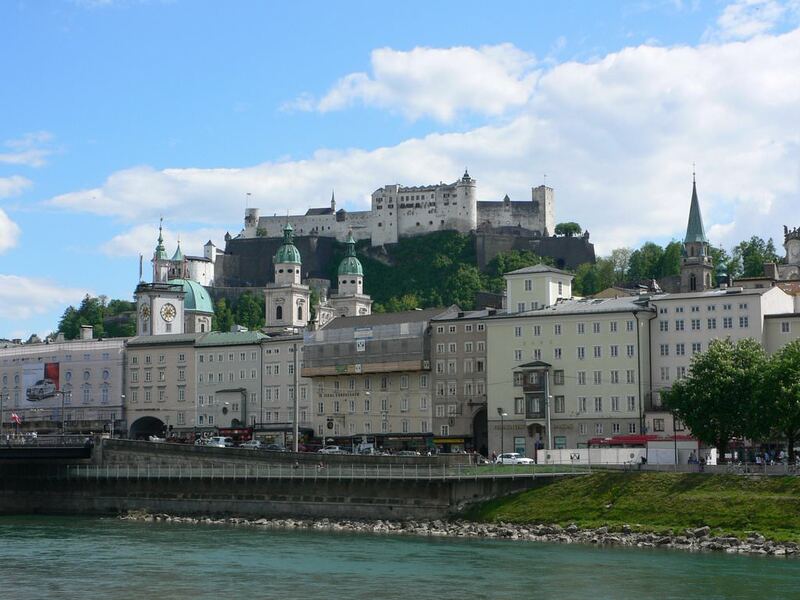 Famous recipes and traditional dishes and courses in Salzburg restaurants. Where to eat - our recommendations on popular places in Salzburg, where you can taste delicious meal and also spend a good time with your friends.